Gödöllő, Szent István University – In Gorka Hall students from 18 different countries arrived with arms full of tasty dishes to amaze the attendance. The Hall’s air was filled by various smells, the tables were covered with national flags with a bunch of proudly smiling students standing behind them. The view could not get any less inviting and a mass of a 100 hungry students just couldn’t get to wait till the highly regarded jury made its first lap around the tables – tasting each and every one of the dishes, salads and desserts. The decision was in their hands: Dr. Zsuzsanna Tarr, Edit Szabadszállási, Gergő János Stefán, Nana Shimizu, Omar Alzaien and Ágnes Lendvai must have had a hard time conceiving who performed the better. While the jury was discussing, all the food was eaten up. Meanwhile, the students could also vote for their favourites: the attendance decided about the Special Prize’s eventual winner. Syria, which team was awarded by Best Salad this time was also victorious last semester when they collected prize for Best Main Dish. 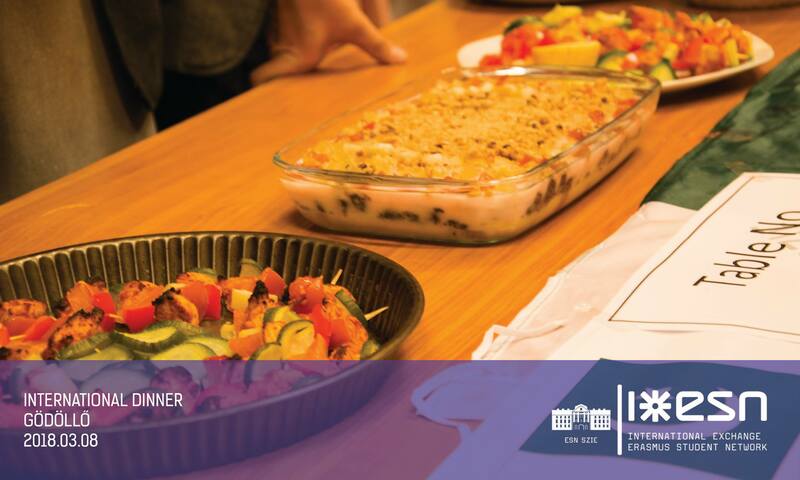 In the name of ESN SZIE, I would like to congratulate all of the participants and thank them for all the time and energy they invested in their dishes. You go little chefs! And don’t miss Fall semester’s International Dinner for another amazing evening celebrating food and each other!